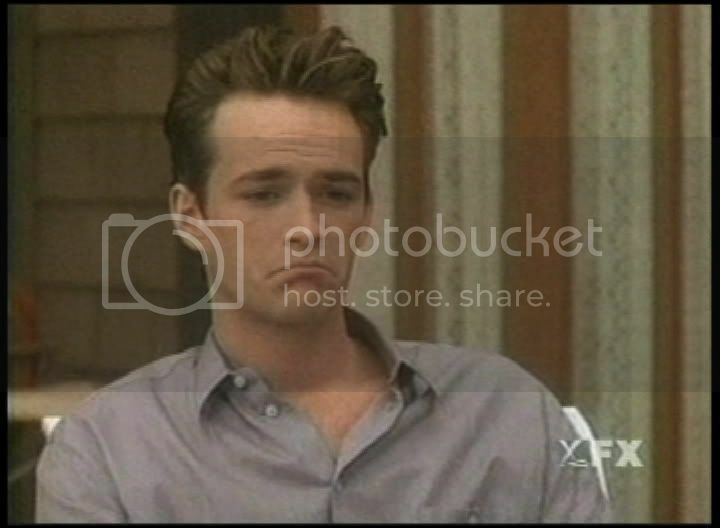 Fan Forum > TV Shows - Past > Beverly Hills 90210 > Dylan♥Kelly #49: Because He Waited Patiently for Her. Thanks for the thread, Mel! I'm from Los Angeles, California. Cool. You and Katherine (SMUSH) are near (enough, in my mind, lol) to BH to be hanging out at the Pit. New caps, and some choice DK expressions. It won't take me too long to drive to BH. Oh, a while ago I passed the Beverly Hilton on my way to a club. I had some serious flashbacks. Dylan looks like a little ! They are too adorable. I love that episode and that convo. Kelly: We don't have to spend every waking hour together to be a couple. They have such big smiles too after. I had some serious flashbacks. What scenes were shot there? Isn't that where the pool is? You know ... "the" pool. Dylan does remind me of a scruffy little dog sometimes, as do any males in a ship of mine. It's how I know I'm endeared to them, lol. Jaime, was it you who suggested "Endless Summer Nights" (Richard Marx) for Dy/K like a year ago? I'm kind of addicted to that song now! It's so perfect. Yes I suggested that song. I have always loved him. Kelly looks So Pretty there. Isn't that where the pool is? Lysee we keep posting the same places. I watched the episode when Brenda got arrested for breaking into the labs and the next one on Soapnet. Why can't she just stop running to Dylan? Kelly was right about that. Yeah, I understand the history and all, but sometimes it's a little... much. Okay, down to business. Does anyone else here keep a running list of the most decent Dy/K vids on YT? Cause I do. And we should agree on a few to put links to in the OP. Again, all brainstorming ideas are in the vault, but I'm not getting much of a response. 15. My as-yet-not-uploaded video, LOL. Some of these have no actual names, so you'll have to find them here: YouTube - Broadcast Yourself. There are several pages. What do you think? Top 10? Top 5? I tried to log in the PB, but it didn't work. I'll check out the vid's though. Mel I would help but I feel totally depressed right now. Even a Spuffy Party isn't helping. The only reason I'm even up is cause I gotta watch over my Nana tonight. I'm really not in the mood to look at vids of any kind. I think I'm going to get ready for tomorrow, guys! Have a great night!